H. Richard Marcus was born in Tifton, Georgia in 1949. He attended the University of Georgia and received a BBA degree in 1971. He attended Emory University School of Law and received his JD in 1974. He is licensed to practice law in Tennessee and Georgia, receiving his license in 1974 and 1975 respectively. He is admitted before the U.S. Supreme Court. 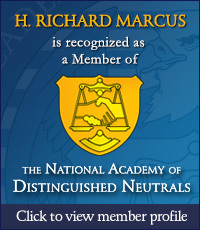 He is a member of American Inns of Court and served as president of the Ray L. Brock & Robert E. Cooper Inn (2006-2007). He is a member of the Tennessee Bar Association, State Bar of Georgia, Chattanooga Bar Association and Lookout Mountain Bar Association. He is also a member of the Tennessee Trial Lawyers. Rick is a Tennessee Supreme Court Rule 31 listed mediator.